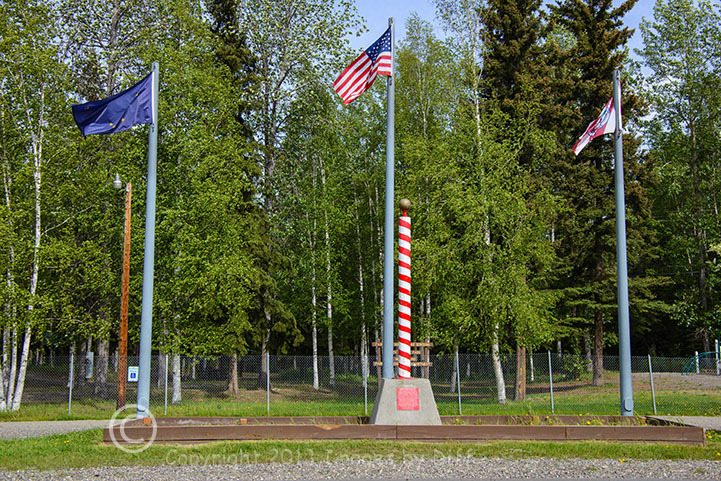 click photo to enlarge After leaving the Denali National Park area we headed north… way north on the George Parks Highway (route 3) as our first destination was North Pole Alaska, an eastern suburb of Fairbanks with a population of just over 2,000. We hardly saw any cars on the way there but we did come to road construction. We later learned that because of the short season there is always some portion of this road under construction in the summer. click photo to enlarge When we drove around town exploring I noticed in the parking lots, the parking spots have electrical outlets and the cars have plugs hanging out the front grill to plug your car in during the cold winters. By the statue of the Unknown Inuit Family we ran into an Inuit Eskimo from Barrow AK so I now refer to him as the Unknown Inuit Eskimo. He did pose for me to take his picture. He went on to tell us it was going to be warm today, the sun was out. Ummm Karen and I had plenty of clothes on because for us it was cold coming from Southern California. 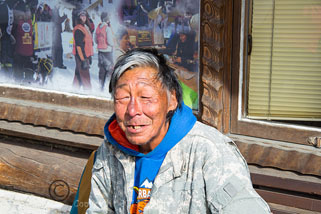 For our unknown Inuit, coming from North America’s Northern most city it was warm. It was about 55 degrees. 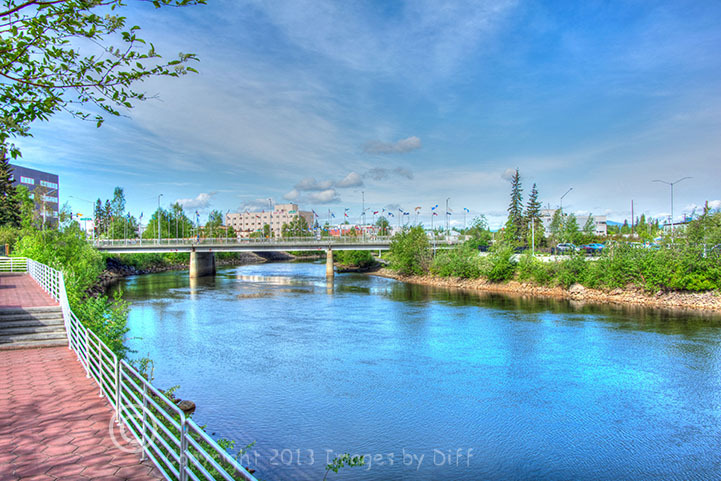 click photo to enlarge Arriving in the North Pole we had 2 things to accomplish.. Eat at one of the places Guy Fiery, from Diners drive ins and dives did, and get some post cards to mail from the North Pole. 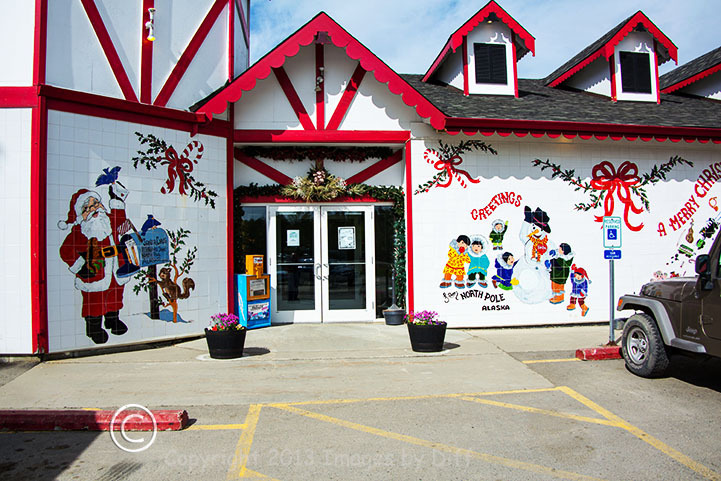 We drove around and scoped the town out then went over to the Santa Claus Gift House and bought some post cards. 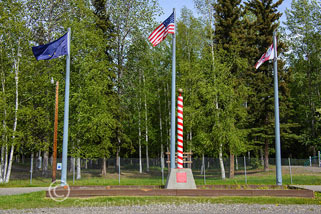 If you mail them from the post office they send them to Fairbanks and they won’t get post marked North Pole. You have to take them to the Santa Clause house and mail from there. They then take them to the post office to be stamped North Pole. 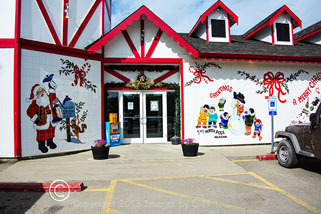 Of course we ate at the Pagoda Restaurant at the North Pole were Guy ate. I mean, just like in the movie Christmas Story, after the dog eats the turkey, you have to go out for Chinese right… I mean I hear this has now become a Cleveland tradition, Chinese at Christmas. After lunch we went to a park and Karen made out the post cards so we could mail them from the North Pole.